- Transmission Controls: Put gear shift lever in NEUTRAL or PARK and range shift lever in NEUTRAL. - PowrReverser Transmission: Put electro-hydraulic (EH) directional reverser lever in NEUTRAL. - Disengage PTO. Lever Operated: Pull PTO lever back to disengage. EH Switch Operated: Push PTO switch knob down to disengage. - Push hitch control lever forward to lower equipment to the ground. If equipped with EH hitch controls, bottom half of raise/lower switch can also be used to lower equipment to the ground. Switch will only operate when engine is running. - Turn key to RUN position and check to see if all indicator bulbs light. Accessory Position: Turn key to Accessory position to power electrical functions. Stop Position: Turn key to STOP position to turn off electrical accessories and to shut down engine. Run Position: Turn key to RUN position and check to see if all indicator bulbs light before advancing to START position. Also use RUN position to activate cold weather starting devices. If temperature is below 5C (41F), refer to Cold Weather Starting procedure in this section. Start Position: Turn key to START position to crank and start engine. Key returns to RUN position when released. Dont run a cold engine at full throttle. Idle engine at 1200 rpm until it warms to operating temperature. - Start from operator's seat with transmission in neutral or park. For PowrReverser Transmission, put EH directional reverser lever in neutral. - Push hand throttle forward from idle position (approximately 1/3 of full throttle). Engine may not start with throttle pulled completely down. Dont operate starter more than 20 seconds at a time. If engine does not start, wait at least 2 minutes for the starter motor to cool before trying again. - Depress clutch pedal and turn key to START position. Release key when engine starts. If key is released before engine starts, wait until starter and engine stop turning before trying again. - Warm up tractor carefully. Charging and oil pressure warning indicators should go off and stay off. Coolant temperature gauge should begin to move into normal range. - Avoid unnecessary engine idling. Check fluid levels frequently for engine oil, coolant, transmission-hydraulic, and mechanical front wheel drive (if equipped). Watch for fluid leaks. 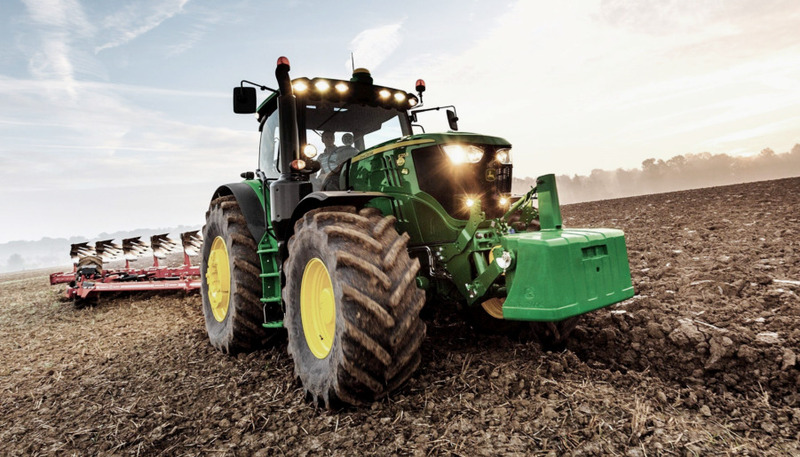 JD 5225 and JD 5325 Tractors are equipped with glow plugs as a standard equipment starting aid. JD 5425, 5525 and JD 5625 Tractors can be equipped with an optional intake air heater system. An electric heating element warms the intake air. - To activate cold weather starting device, turn key to RUN position, push in and hold: 10 or 15 seconds for temperatures above 0C (32F) / 30 seconds for temperatures below 0C (32F). - Depress clutch pedal and turn key to START position. - If engine runs rough, press in on key to reactivate cold weather starting device until engine runs smoothly. - Idle engine at 1200 rpm until it warms to operating temperature. If temperature gauge (A) indicates hot (red zone), or either charging system or oil pressure indicators (B or C) fail to go out, stop engine and determine the cause. If tractor runs out of fuel and will not start in several tries, bleed air from fuel system. - 5325, 5225 John Deere: Slow idle speed should be 900 ±50 rpm. At light or no load, full throttle speed will increase to 2625 ±50 rpm. - 5525, 5425, 5625 John Deere: Slow idle speed should be 825 ±25 rpm. At light or no load, full throttle speed will increase to 2625 ±25 rpm. - Normal working speed is 1600-2400 rpm rated speed. Within these limits engine can be put under full load. With PTO shift lever in 540E position, engine fast idle speed is limited to 1700 rpm. - Economical 540E PTO operation (lighter load): Increase engine speed until tachometer needle is aligned with 1700 rpm mark. - Standard 540 rpm or 1000 rpm (if equipped) PTO operation (load requiring full engine power): Increase engine speed until tachometer needle is aligned with 2400 rpm mark. Approximate fuel tank capacity is: 1) Straddle Mount and Hi-Crop-96.5 L (25.5 gal). 2) Cab and IOOS-126.8 L (33.5 gal). Filter location: 1) Straddle Mount and Hi-Crop-Front of fuel tank on left side. 2) Cab and IOOS-Along right side of transmission, under floor plate. - Remove in-line fuel filter. - Install new filter with "arrow" toward front of tractor. JD 5525, 5425 and JD 5625: During the first 100 hours of operation, fill with Original DIESEL ENGINE BREAK-IN OIL. Make sure to push dipstick all the way in to check oil level. - Park tractor on level ground, place transmission in park, turn off engine and remove key. - Pull out dipstick. Oil level should be between two marks on dipstick. - If level is low, add oil through oil filler hole until even with upper mark. Dont overfill. Use seasonal viscosity grade oil. Place a small container under drain fitting to catch draining fuel. Dispose of waste properly. - Open fuel tank drain plug to bleed accumulated moisture and sediment from the fuel tank. Tighten plug when clear fuel runs from fitting. - Raise hood and open fuel filter/water separator drain to bleed accumulated moisture and sediment from filter. Tighten drain when clear fuel runs from drain. Add make-up coolant through the coolant recovery tank, not directly to the radiator. If cap must be removed, do not remove when engine is hot. Shut engine off and wait until cap is cool enough to touch with bare hands. Slowly loosen cap to relieve pressure before removing completely. Periodically check coolant level in radiator. If cap should become defective, coolant would not be drawn from recovery tank and could cause the engine to overheat. Replace cap as necessary. - Raise hood and check level in coolant recovery tank, before starting tractor. Coolant level should be checked when engine is cool. - If engine is cool and level is below "MIN" mark, remove cap and add coolant to recovery tank to bring level between "MIN" and "MAX" mark. - Install cap and lower hood. - Operate engine to warm oil. Park tractor on level ground, place transmission in park, turn off engine and remove key. Raise hood. - Remove oil drain plugand drain oil. Remove engine oil filter. Make sure old filter gasket is completely removed from manifold before installing new filter. - Apply a film of oil on new oil filter gasket and install new filter. Hand-tighten plus 1/2 turn. - Install drain plug. Add oil to filler. Engine Crankcase Oil Capacity - 8.5 L (9 qt). - Start engine and check for leaks. - Stop engine and remove key. Recheck oil level. Lower hood. - Remove oil drain plug and drain oil. Remove engine oil filter. - Install drain plug. Clean area around filler to prevent dirt and debris from entering valve cover. - Add oil to filler. Engine Crankcase Oil Capacity - 10L (11 qt). - Start engine and check for leaks. Stop engine and remove key. Recheck oil level. Lower hood. - Raise hood. Open drain valve and drain fuel. - Remove fuel filter. Install new filter. - Bleed the fuel system. - Raise hood. Open drain valve (C) and drain fuel. - Lift up and rotate retaining ring (A) counterclockwise. Remove ring with filter (B). - Remove separator (D) from filter. Drain and clean separator. Dry with compressed air. - Install water separator on new filter. Install new filter assembly. Tighten retaining ring hand-tight. - Never pour cold water into the cooling system of a hot engine, as it might crack cylinder block or head. - Dont operate engine without coolant for even a few minutes. - Check cooling system for leaks. Check and tighten all hoses and clamps if required. Inspect radiator and coolant recovery tank. - Make-up coolant is added to the coolant recovery tank rather than directly to the radiator. - Release three clips and remove cover. Rotate primary element counterclockwise and pull out. - Clean out any dirt in canister, taking care not to damage secondary filter element. Remove secondary element (inner element) only if it is to be replaced. Immediately install new element to prevent dust from entering air intake system. - Pull out secondary element if necessary. Clean out inside of cover and canister. Dont attempt to clean filter elements. They must be replaced with new elements. Inspect elements before installing. - Install air cleaner elements in reverse order of removal using the following special instructions: Wipe end seal clean before installing a new element or reinstalling a used primary element that has not reached the end of it's service interval. Install cover with inlet "arrow" (stamped in cover) pointing down. - If replacing air cleaner canister, make sure that the dust unloader valve is facing down. - Whenever trash builds up on front grille, stop engine and brush clean. Reduce compressed air to less than 210 kPa (2 bar) (30 psi) when using for cleaning purposes. Clear area of bystanders, guard against flying chips, and wear personal protection equipment including eye protection. - Raise hood and see if trash has built up on radiator, oil cooler (if equipped), or A/C condenser (cab). If so, remove it using a brush or compressed air. - If a more thorough cleaning is necessary, clean radiator from behind with compressed air or water. Straighten any bent fins. A belt tension gauge will not give an accurate measurement of the belt tension. Measure tensioner spring tension using a torque wrench. - Remove fan belt. Put a mark on swing arm of tensioner as shown. - Measure 21 mm (0.83 in.) from and put a mark on tensioner mounting base. - Rotate the swing arm using a torque wrench until marks are aligned. John Deere 5225, 5325: PUSH tensioner with torque wrench toward engine. 5425, 5525, 5625 John Deere: PULL tensioner with torque wrench away from engine. - Record torque wrench measurement and compare with specification. If recorded measurement is below specifications, have your John Deere dealer replace tensioner assembly. Belt Tensioner Torque - 18-22 Nm (159-195 lb-in.). Install fan belt. Fan drive belt is equipped with an automatic tensioner which does not require adjustment. - Loosen oil fill hose clamp at engine. Remove four hex socket head cap screws and remove oil fill assembly. - Remove hex socket head cap screw from bottom of guard. - Remove two cap screws retaining right-side guard to radiator and remove guard. - Remove hex socket head cap screw from bottom of left-side guard. - Remove cap screw from guard support bracket at engine. - Remove two cap screws retaining left-side guard to radiator and remove guard. - Using a 3/8 in. drive breaker bar inserted in square hole of tensioner, push tensioner in towards engine and release tension on fan belt. Remove fan belt from alternator pulley. Release tension on tensioner and remove breaker bar. - Remove belt. Install new belt in reverse order of removal. Cab Tractors: Dont remove belt guard fastened to A/C compressor. Compressor will be loose if cap screws are removed. - Remove hex socket head cap screw, washer and flanged nut from right-side guard brace. - Remove two cap screws retaining guard to radiator. Remove right-side guard. - Remove hex socket head cap screw, washer and flanged nut from left-side guard brace. - Remove two cap screws retaining guard to radiator. Remove left-side guard. - Loosen right-side cap screw. Remove left-side cap screw. Swing damper guard forward away from damper. - Release tension on belt using a long-handle 1/2 in. drive breaker bar to pull tensioner away from engine. Remove belt from alternator pulley. - Release tension on tensioner and remove breaker bar. Remove belt. Install new belt in reverse order of removal. - Check fuel level. Fuel tank must be full. Add if necessary. - Raise hood and loosen fuel return line. - Loosen filter base bleed screw. - Push priming pump until fuel runs out smoothly without spitting, then tighten bleed screw. - Loosen injection pump bleed screw. - Push priming pump until fuel runs out smoothly without spitting, then tighten fuel return line. - Tighten bleed screw and lower hood. - Raise hood and remove side screens. - Remove nut and disconnect negative (ground) battery cable. - Remove nut and disconnect positive cable. - Loosen nuts and rotate battery hold-down. Remove battery. - Install battery in reverse order of removal.